Students in Athlone Institute of Technology (AIT) have created a series of mental health illustrations as part of the ‘Now We’re Talking Mental Health Campaign’. The campaign is running in conjunction with Lyons’ tea and Pieta House, with this particular project posing the AIT students with real mental health challenges to base their illustrations on. Hot Press adjudicated this project by choosing specific illustrations that represented the technical and conceptual aspects of the topic well and announced an overall winner among the students. The students based many of the illustrations on their own understanding of mental health, drawing on their own personal experiences in life for inspiration. The students’ designs featured illustrations that visually represented the difficulties that people have in communicating how they are feeling with regards to their mental health. 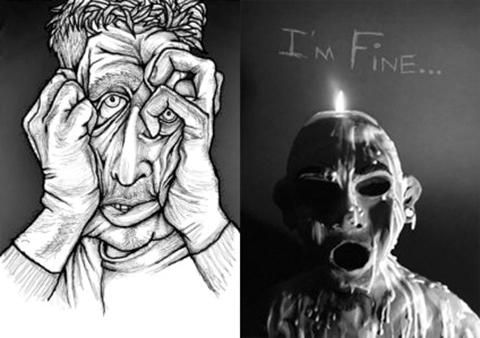 The winning illustration by Gosia Kosel featured a man made out of clay that was photographed and given a stark black and white filter, with scrawled, childlike writing above the candle-wax-man reading “i’m fine”. Outside of this project, AIT is working towards reforming mental health services across colleges in Ireland, with their Students Union calling on the government to invest €3 million in mental health counselling to reduce the strain on support services on third-level campuses. They have also called on the government to invest a further €55 million annually to tackle Ireland’s growing mental health crisis. On October 10th, 2018 they organised a demonstration to coincide with World Mental Health Awareness Day. AIT SU Vice President of Welfare and Accommodation, Aine Daly said: “While our institute has been extremely proactive in trying to meet the needs of our students, competing demands for limited resources are making it extremely difficult.